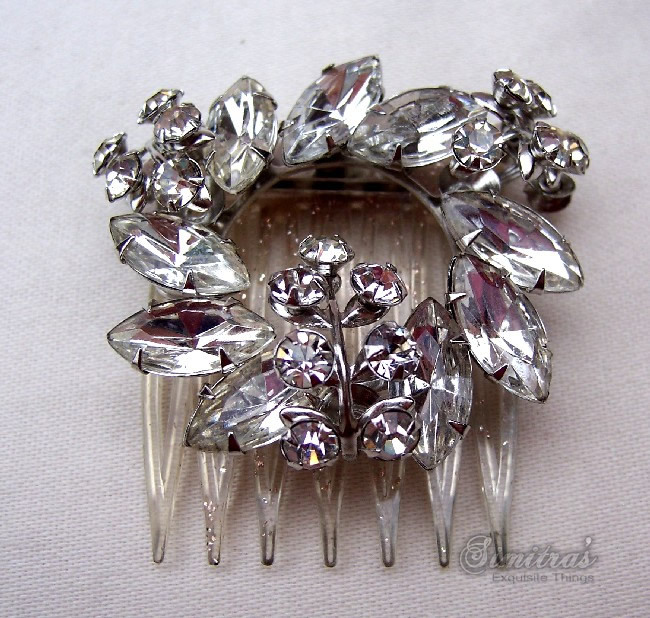 This beautiful and rather glitzy comb clip features a formalised wreath motif set with large prong set clear rhinestones in both spherical and marquise shapes. The heading is set on a rotating hinge which attaches is to the clear Lucite comb mount. This means that the ornament is adaptable to various positions within the hair and grips firmly. It is made in the elaborate neo-Baroque style which came into fashion from the early 1950s and probably date from the mid to late 1950s. For more information on the hair accessories of the period 1950s to 1960s see my article in the ARTICLES section. This is a complete wardrobe of three vintage hair barrettes probably dating from the period 1950s to 1960s. They comprise a matched pair and one single. 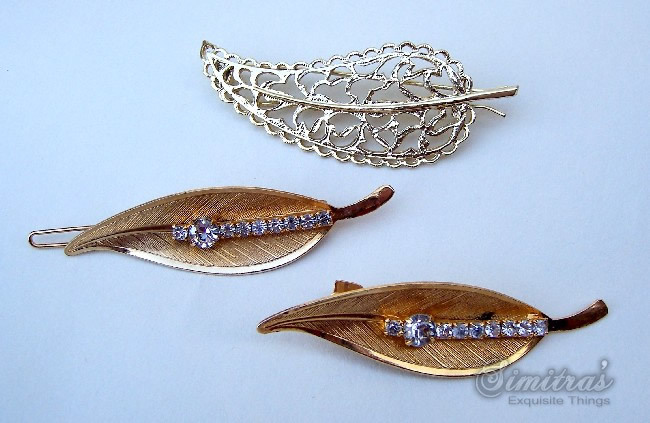 All three are very similar in appearance, being made from goldtone metal and featuring a leaf shape. This was one of the iconic motifs in jewellery of the period. The matched pair are in textured goldtone with further embellishment of clear rhinestones. They have a metal post and bar fitting. The openwork single barrette has a similar fastening consisting of a double metal bar. These would be an ideal set of hair accessories for business wear or to take the business woman from work into evening, to wear for a glamorous occasion such as a party or theatre. This is a complete wardrobe of three vintage hair combs probably dating from the period 1950s to 1960s. 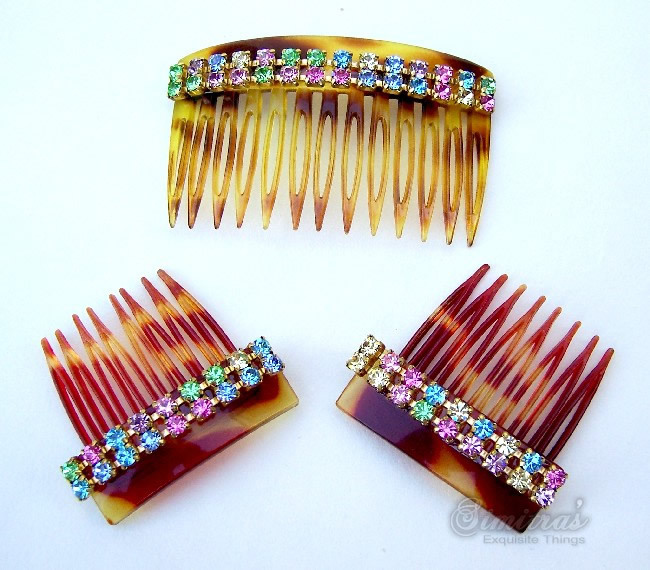 They are not a matching set but are very similar in appearance, being made from faux tortoiseshell effect celluloid with an embellishment of multi coloured prong set rhinestones. The large comb is back stamped FRANCE. The two smaller combs, which are a matched pair, are unmarked. 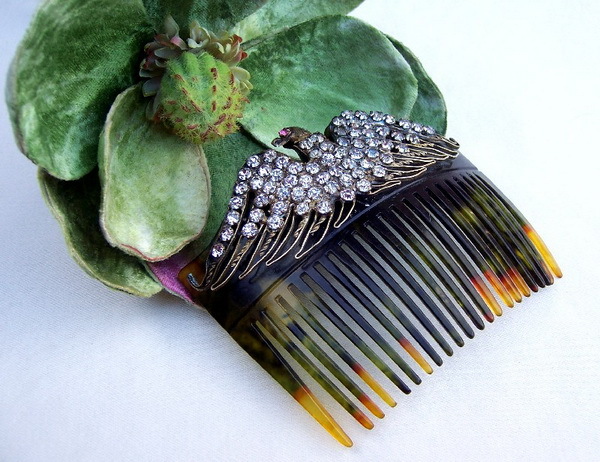 This would be an ideal set of combs to wear for a glamorous occasion such as a party, theatre or prom.